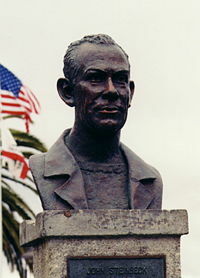 A bust of John Steinbeck located on Cannery Row in Monterey, California, the setting of his 1945 novel Cannery Row. John Ernst Steinbeck (February 27 1902 – December 20 1968) was one of the best-known and most widely read American writers of the twentieth century. A winner of the Nobel Prize for Literature in 1962, he wrote Of Mice and Men (1937) and the Pulitzer Prize-winning novel The Grapes of Wrath (1939), both of which examine the lives of the working class and migrant workers during the Dust Bowl and subsequent Great Depression. Steinbeck often populated his stories with struggling characters, and his fiction drew on real historical conditions and events in the first half of the twentieth century. His body of work reflects his wide range of interests, including marine biology, politics, religion, history, and mythology. Seventeen of his works, including Cannery Row (1945), The Pearl (1947), and East of Eden (1952), went on to become Hollywood films (some even multiple times), and Steinbeck also achieved success as a Hollywood writer, receiving an Academy Award nomination for Best Story in 1944 for Alfred Hitchcock's Lifeboat. Steinbeck was a socialist who, like many intellectuals of his era, idealized the working class and accentuated class divisions in his writings. His depictions of class conflict and exploitation of the poor were informed by genuine empathy toward victims of social injustice, yet provoked controversy. The social realism, psychological insight, and vividly drawn protagonists of his most influential work, The Grapes of Wrath, had a lasting impact on public attitudes toward migrant laborers and has been compared to Harriet Beecher Stowe's Uncle Tom's Cabin, which significantly influenced popular attitudes toward slavery in Southern culture. The house in Salinas, California where John Steinbeck lived until he was 17 years old. John Ernst Steinbeck was born in Salinas, California, of German American and Irish American descent. Johann Adolf Großsteinbeck (i.e. Grossteinbeck), Steinbeck's grandfather, changed the family name from Grossteinbeck to Steinbeck when he migrated to the United States. His father, John Steinbeck, Sr., served as the Monterey County Treasurer while his mother, Olive (Hamilton) Steinbeck, a former school teacher, fostered Steinbeck's love of reading and writing. During summers he worked as a hired hand on nearby ranches. Steinbeck graduated from Salinas High School in 1919. He then attended Stanford University intermittently until 1925, then departing to New York City without graduating to pursue his dream as a writer. However, he was unable to get any of his work published and returned to California. Steinbeck's first published novel, Cup of Gold, based on the privateer Henry Morgan's life and death, was published in 1929. The novel centers on Morgan's assault and sacking of Panama City, sometimes referred to as the "Cup of Gold," and the woman "fairer than the sun" reputed to be found there. Steinbeck followed this with three further novels between 1931 and 1933. The Pastures of Heaven, published in 1932, consisted of twelve interconnected stories about a valley in Monterey, California, which was discovered by a Spanish corporal while chasing runaway American Indian slaves. In 1933 Steinbeck published two works; The Red Pony is a short 100-page, four-chapter novella, which recollects memories from Steinbeck's childhood. To a God Unknown follows the life of a homesteader and his family in California. Steinbeck achieved his first critical success with the novel Tortilla Flat (1935), which won California Commonwealth Club's Gold Medal. The book portrays the adventures of a group of young men in Monterey who denounce society by enjoying life and wine before U.S. Prohibition in the 1920s. The book was made into a film of the same name in 1942, starring Spencer Tracy, Hedy Lamarr, and John Garfield. Steinbeck began to write a series of "California novels" and Dust Bowl fiction, set among common people during the Great Depression. These included In Dubious Battle in 1936, Of Mice and Men in 1937, and The Grapes of Wrath in 1939. Of Mice and Men is a novel written in the form of a tragedy play. The story follows two traveling ranch workers, George and the dim-witted but physically powerful itinerant farmhand Lennie, trying to work up enough money to buy their own farm. It encompasses themes of racism, loneliness, prejudice against the mentally ill, and the struggle for personal independence. Along with Grapes of Wrath, East of Eden, and The Pearl, Of Mice and Men is one of Steinbeck's best known works. Of Mice and Men was critically acclaimed and the stage adaptation of the work was also a success, starring Broderick Crawford as Lennie and Wallace Ford as George. However, Steinbeck refused to travel from his home in California to attend any performance of the play during its New York run, telling Kaufman that the play as it existed in his own mind was "perfect," and that anything presented on stage would only be a disappointment. Steinbeck would ultimately write only two stage plays (his second was an adaptation of The Moon Is Down). The novel was made into a movie three times, in 1939 starring Burgess Meredith, Lon Chaney Jr., and Betty Field, in 1982 starring Randy Quaid, Robert Blake and Ted Neeley, and in 1992 starring Gary Sinise and John Malkovich. Steinbeck followed this success with The Grapes of Wrath (1939), based on newspaper articles he had written in San Francisco, and considered by many to be his finest work. The novel won the Pulitzer Prize in 1940 even as it was made into a famous film version starring Henry Fonda and directed by John Ford. The success of The Grapes of Wrath, however, was not free of controversy, as Steinbeck's leftist political views, portrayal of the ugly side of capitalism, and mythical reinterpretation of the historical events of the Dust Bowl migrations led to backlash against the author, especially close to home. In fact, claiming the book was both obscene and misrepresented conditions in the county, the Kern County Board of Supervisors banned the book from the county's public schools and libraries in August 1939. This ban lasted until January 1941. Of the controversy, Steinbeck himself wrote, "The vilification of me out here from the large landowners and bankers is pretty bad. The latest is a rumor started by them that the Okies hate me and have threatened to kill me for lying about them. I'm frightened at the rolling might of this damned thing. It is completely out of hand; I mean a kind of hysteria about the book is growing that is not healthy." The film versions of The Grapes of Wrath and Of Mice and Men (by two different movie studios) were in production simultaneously. Steinbeck spent a full day on the set of The Grapes of Wrath and the next day on the set of Of Mice and Men. Steinbeck divorced his first wife, Carol Henning, in 1943. He immediately married Gwyn Conger that same year, and had two sons, Thomas Myles in 1944 and John Steinbeck IV (Catbird), in 1946. They divorced in 1948. Two years later, Steinbeck married Elaine Scott, the ex-wife of actor Zachary Scott. They were married until his death in 1968. In 1940, Steinbeck's interest in marine biology and his friendship with Ed Ricketts led him to a voyage in the Gulf of California, also known as the "Sea of Cortez," where they collected biological specimens. Steinbeck's narrative portion of this collecting expedition (with some philosophical additions by Ricketts) was later published as The Log from the Sea of Cortez, and describes the daily experiences of the trip. The full catalog of the marine invertebrates taken was also published as a biological catalog of the intervertebrate life of the Gulf of California. While it remains a classic in nature studies, it failed to find a popular audience. Ricketts had a significant impact on Steinbeck as a social traveling companion and fellow researcher on trips to collect biological specimens. 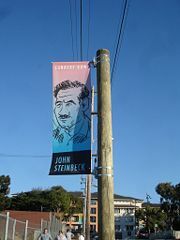 Steinbeck even based his character "Doc" in the novels Cannery Row and Sweet Thursday on Ricketts. Steinbeck's close friendship with Ricketts would end when Steinbeck moved away from Salinas when separating from his wife Carol. During the Second World War, Steinbeck served as a war correspondent for the New York Herald Tribune. During the war, Steinbeck saw action in accompanying some of the commando raids of Douglas Fairbanks, Jr.'s Beach Jumpers program, which (among other things) launched small-unit diversion operations against German-held islands in the Mediterranean. As a war correspondent, Steinbeck would certainly have been executed if he had been captured with the automatic weapon which he routinely carried on such missions. These missions would help to earn Fairbanks a number of decorations, but as a civilian, Steinbeck's role went officially unrecognized. Some of Steinbeck's writings from his correspondence days were later collected and made into Once There Was A War (1958). During the war, he continued to work in film, writing Alfred Hitchcock's Lifeboat (1944), and the film A Medal for Benny (1945), about paisanos from Tortilla Flat going to war. John Steinbeck later requested that his name be removed from the credits of Lifeboat, because he believed the final version of the film had racist undertones. His novel The Moon is Down (1942), about the Socrates-inspired spirit of resistance in a Nazi-occupied village in northern Europe, was made into a film almost immediately. It is presumed that the country in question was Norway, and in 1945 Steinbeck received the Haakon VII Medal of freedom for his literary contributions to the Norwegian resistance movement. After the war, he wrote The Pearl (1947), already knowing it would be filmed, and traveled to Mexico for the filming; on this trip he would be inspired by the story of Emiliano Zapata, and wrote a film script (Viva Zapata!, which was directed by Elia Kazan and starred Marlon Brando and Anthony Quinn. In 1948 Steinbeck again toured the Soviet Union, together with renowned photographer Robert Capa. They visited Moscow, Kiev, Tbilisi, Batumi and the ruins of the Battle of Stalingrad. He wrote a humorous report book about their experiences, A Russian Journal, that was illustrated with Capa's photos. Avoiding political topics and reporting about the life of simple Soviet peasants and workers, Steinbeck tried to generate more understanding towards the Soviet people in a time when anti-Communism was widespread in the U.S. and the danger of war between the two countries was heightened. In the same year he was also elected to the American Academy of Arts and Letters. Following his divorce of Gwyndolyn Conger, and the sudden, tragic death of his close friend Ed Ricketts, Steinbeck wrote one of his most popular novels, East of Eden (1952). This book, which he considered his best, traces the fortunes of two families of settlers, the Trasksand the Hamiltons—based on Steinbeck's maternal ancestry—and set in rural California in the years around the turn of the century. The novel is roughly adapted from the biblical story of Cain and Abel and follows to trajectory of lives of sharply contrasting values. In 1952, Steinbeck appeared as the on-screen narrator of 20th Century Fox's film, O. Henry's Full House. Although Steinbeck later admitted he was uncomfortable before the camera, he provided interesting introductions to several filmed adaptations of short stories by the legendary writer O. Henry. About the same time, Steinbeck recorded readings of several of his short stories for Columbia Records; despite some obvious stiffness, the recordings provide a vivid record of Steinbeck's deep, resonant voice. Following the success of Viva Zapata!, Steinbeck collaborated with Kazan on the theatrical production of East of Eden, James Dean's film debut. Steinbeck found the actor was arrogant, but nevertheless said that Dean was the perfect person to play Cal Trask. In 1960, Steinbeck bought a pickup truck and had it modified with a custom-built camper top—rare for that day—and drove across the United States with his faithful poodle, Charley. In the sometimes comical, sometimes melancholic book, Travels with Charley: In Search of America, Steinbeck describes his journeys from Maine to Montana to California, and from there to Texas and Louisiana and back to his home in Long Island. In the work, Steinbeck reminisces about his lost youth and lost roots, and both criticizes and praises America on many levels. The restored camper truck is on exhibit in the National Steinbeck Center in Salinas, California. Steinbeck's last novel, The Winter of Our Discontent, was written in 1961. In many of his letters to friends, he spoke of how this book was his statement on the moral decay of the U.S. culture, and it is quite different in tone to Steinbeck's amoral and ecological description of the innocent thievery of the protagonists of his earlier works such as Tortilla Flat and Cannery Row. The novel was critically savaged and commercially unsuccessful. [T]he writer is delegated to declare and to celebrate man's proven capacity for greatness of heart and spirit – for gallantry in defeat, for courage, compassion and love. In the endless war against weakness and despair, these are the bright rally flags of hope and of emulation. I hold that a writer who does not believe in the perfectibility of man has no dedication nor any membership in literature." Steinbeck's literary background brought him into close collaboration with leftist authors, journalists, and labor union figures, who may have influenced his writing. Steinbeck was mentored by radical writers Lincoln Steffens and his wife Ella Winter, and through Francis Whitaker, a member of the United States Communist Party’s John Reed Club for writers, Steinbeck met with strike organizers from the Cannery and Agricultural Workers' Industrial Union. Steinbeck complained publicly about government harassment. In a 1942 letter to United States Attorney General Francis Biddle he wrote "Do you suppose you could ask Edgar's boys to stop stepping on my heels? They think I am an enemy alien. It is getting tiresome". The FBI issued ingenuous denials that Steinbeck was not "under investigation." In fact, Steinbeck was indeed the object of intense FBI scrutiny, although not technically "under investigation," a term reserved in FBI parlance for investigation in connection with a specific crime. Steinbeck was also screened for of his political beliefs by Army Intelligence during World War II to determine his suitability for an officer's commission. They found him ideologically unqualified. In later years, he would be criticized from the left by those who accused him of insufficient ideological commitment to Socialism. In 1948 a women's socialist group in Rome condemned Steinbeck for converting to "the camp of war and anti-Marxism." Then in a 1955 article in the Daily Worker his portrayal of the American Left was criticized. In 1967, at the behest of Newsday Steinbeck went to Vietnam to report on the war. Steinbeck saw the Vietnam War as a heroic venture, and his sons both served in Vietnam prior to his death. Steinbeck visited one son on the battlefield (at one point being allowed to man a machine-gun watch position at night at a firebase, while his son and other members of his platoon slept). His sympathetic portrait of the United States Army caused the New York Post to denounce him for betraying his liberal past, while Steinbeck biographer Jay Parini has suggested that Steinbeck's personal affection for Lyndon Johnson, whom he considered a friend, influenced his view of the war. Earlier, in September 1964, Steinbeck had been awarded the United States Medal of Freedom by President Johnson. Steinbeck was a close associate of playwright Arthur Miller, author of Death of a Salesman and The Crucible. In the 1950s, Steinbeck took a personal and professional risk by standing up for his companion, who was held in contempt of the United States Congress for refusing to name names in the infamous House Un-American Activities Committee trials. Steinbeck called the period one of the "strangest and most frightening times a government and people have ever faced." John Steinbeck died of a heart attack on December 20, 1968 in New York City. In accordance with his wishes, his body was cremated and an urn containing his ashes were interred at his family gravesite in Salinas. His third wife, Elaine was buried with him in 2004. Like William Faulkner and Mississippi, Steinbeck was deeply associated with a specific region. Drawing from his experiences in Salinas Valley, California, and the migrations of laborers into California in the 1930s, Steinbeck composed fiction richly informed by local scene, speech, and history. He expressed special empathy for the downtrodden, those deprived of dignity and in extreme want, yet animated by emotions, hopes, and ideals that transcend class. Steinbeck dramatized the social upheaval of the Great Depression and Dust Bowl era, and criticized impersonal economic forces that divided society into haves and have-nots. Steinbeck has been criticized both for his socialist political leanings and the unevenness of his fiction. In his lesser novels, comic episodes of promiscuity give way to socially dysfunctional behavior that is treated sentimentally, obscuring the moral import of the action. In his greatest works, notably The Grapes of Wrath and East of Eden, Steinbeck explored contemporary social history with insight into human psychology and dramatic storytelling. On the strength of these works Steinbeck became known throughout the world, receiving the Nobel Prize for Literature in 1962. "His place in [U.S.] literature is secure," reviewer Charles Poore wrote in the New York Times. And it lives on in the works of innumerable writers who learned from him how to present the forgotten man unforgettably." Many of Steinbeck's works are often included on required reading lists in American high schools, as well as in other countries, notably in Canada and the United Kingdom. In the United Kingdom Of Mice and Men is one of the key English Literature texts used by the examining body. A study by the Center for the Learning and Teaching of Literature in the United States found that Of Mice and Men was one of the ten most frequently read books in both public high and independent schools. ↑ Steineck backlash of his portrayal of the depression - Retrieved October 24, 2007. ↑ Elise Palos, Roadsigns 4 (4) Steinbeck Book Ban - Retrieved October 24, 2007. ↑ Steinbeck Novel Prize Acceptance Speech Retrieved September 18, 2008. ↑ Keith Windschuttle, Steinbeck's myth of the Okies by Keith Windschuttle Newcriterion.com. Retrieved October 24, 2007. ↑ The Smoking Gun: Archive Turner Entertainment Digital. Retrieved October 24, 2007. ↑ Steinbeck Political Beliefs, Smoking Gun - Retrieved October 24, 2007. ↑ Presidential Medal of Freedom, Steinbeck. medaloffreedom.com- Retrieved October 24, 2007. ↑ Books taught in Schools, Center for the Learning and Teaching of Literature ERIC Digests. Retrieved October 24, 2007. This page was last modified on 23 May 2018, at 15:00.